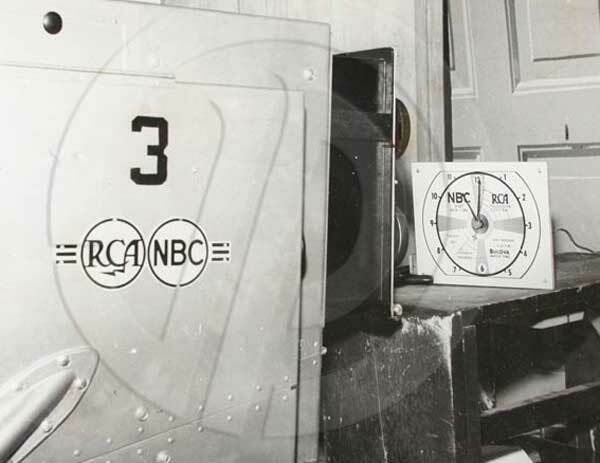 When commercial TV began in July 1941, New York City had three stations on the air. 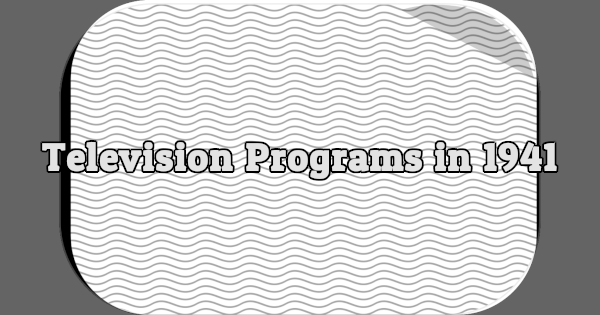 Although NBC had the only commercial license, CBS offered the most programs on a weekly basis. Learn about some of TV’s earliest shows, including Thrills & Chills Everywhere, Men at Work, Fashion Discoveries in Television, and more. After several years of false starts and missteps on May 2nd, 1941 the Federal Communications Commission announced that “recent developments demonstrate the industry is entirely within agreement with television broadcasting and is ready for standardization” and set July 1st as the start of “full commercialization” of television [1, 2]. Stations wishing to operate commercially would have to broadcast at least fifteen hours per week . Weighing heavily on the mind of broadcasters and manufacturers alike was the issue of defense production, which could heavily curtail the number of sets available for the public . Nonetheless, after months of setbacks commercial broadcasting was officially on the way. There would be no stopping it now. As the de facto capital of television, New York City was perhaps best prepared for the start of commercial broadcasting. In an article discussing the FCC’s authorization of commercial television, The New York Times reported that by July 1st there could be three television stations operating within New York City . NBC’s W2XBS station (atop the Empire State Building) was currently broadcasting weekly on an experimental basis, while the CBS (atop the Chrysler Building) and DuMont (atop building on Madison Avenue and Fifty-Third Street) stations would be ready by the time commercial broadcasting began . Other cities with their own television stations included Philadelphia, Boston, Chicago and Los Angeles . The potential audience for these stations, however, was small. As of May 1941, the National Association of Broadcasters estimated that there were only 7,000 television sets in operation, with 5,000 of them in the metropolitan area of New York City compared to 50 in Chicago . A total of four sponsors were involved: Lever Brothers for Spry shortening, Proctor & Gamble for Ivory soap, the Sun Oil Company and the Bulova Watch Company . The very first commercial, shown at 2:30PM, was for the Bulova Watch Company and consisted of a static image of a watch shown for one minute with the company’s name. It cost $4 (another one minute commercial in the evening cost $8) . But it is Uncle Jim’s Question Bee that can claim to be television’s very first sponsored program, with Spry shortening being hawked during commercial breaks . New York wasn’t the only city lucky enough to have at least one television station broadcasting commercially. Some twenty-one other stations across the country also began operating commercially during the first week of July. According to The New York Times, “[s]porting events formed the major part of the programs offered” . Both NBC and CBS continued to broadcast throughout the summer of 1941. But during its first month accepting advertisements, WNBT only aired four sponsored programs . Its programming week was filled mostly with test patterns, films, sporting events and irregularly scheduled studio shows . WCBW, meanwhile, offered a more stable schedule, with several weekly programs as well as daily fifteen-minute news reports shown from 2:30-2:45PM and again from 8-8:15PM. Beginning July 7th, 1941, WCBW broadcast an hour-long variety show called Men at Work every Monday from 8:30-9:30PM (starting with the December 22nd, 1941 broadcast, the show was cut down to 55 minutes; a five-minute news program was shown from 9:25-9:30PM). Worthington Miner, the CBS director-in-chief of television, was in charge of Men at Work. Each program took two hours to rehearse and practice . During any given show, viewers might watch singers, dancers, bicyclists, acrobats, roller skaters, mimics, comics, toe dancers, boxing cats, puppeteers, marionettes, Indian dancers, ballroom dancers, comic cellists and more. Some of the acts seen on the program included Lou and Dorothy Rowlands (roller skaters), Hildegarde Halliday (mimic), the Two Deweys (jugglers), Hank Henry and Robert Alda (comics), Ruth Page and Bentley Stone (dancers), Burl Ives (singer), Reid and Mack (acrobats) and Libby and Betty (bicyclists), to name but a few. Men at Work last seen on Monday, January 26th, 1942, after thirty broadcasts . On Wednesday, July 2nd, 1941, WBCW premiered an hour-long quiz show aptly titled CBS Television Quiz. Produced and hosted by Gil Fates, CBS Television Quiz was both the first regularly scheduled quiz program (although not the first sponsored quiz program) and the first quiz program to provide contestants with answers and have them answer with the question . Fates would later produce more famous quiz shows such as I’ve Got a Secret, To Tell the Truth and What’s My Line?. Frances Buss served as scorekeeper for the program, which shifted to Thursdays beginning October 2nd, 1941 . It was cut to 55 minutes beginning January 8th, 1942 and was followed by a five minute news summary. CBS Television Quiz moved to Mondays starting February 2nd, 1942, and it was briefly preceded by a five minute civilian defense program and later a Red Cross program, chopping another five minutes. The Red Cross program disappeared at the end of March. CBS Television Quiz was last shown on Monday, May 25th, 1942. This four-week series was sponsored by Bloomingdale’s of Manhattan and Abraham & Straus of Brooklyn. It was the first commercial fashion show and was produced by Norman D. Waters, who declared that “[t]elevision will exert a greater influence on fashion than any factor yet known” . The show was seen on Thursdays from 5-5:30PM beginning September 18th, 1941 and ending October 9th, 1941. An advertisement promoting the premiere of the show in The New York Times (which gave the title “Fashion Premieres Of Television”) stated that it wasn’t “just a model parade but a cleverly devised playlet that makes fashions live. Beautiful manikins, that talk and sing, an announcer who is a well-known authority on women’s styles. See it over your own television set or in either store” . The first broadcast, titled “5 o’Clock Party,” included music from the Four Singing Harry Conover Models along with rumba dancing. Peggy Read served as commentator. A review in The New York Times lamented the fact that the television audience was unable to see the dresses, skirts and gowns in color. Nevertheless, the review concluded by stating that “[t]hough fabric and shade are not for the television audience, silhouette, pattern and decorative motive can be sent successfully through the ether as demonstrated yesterday” . Thrills and Chills premiered on Wednesday, August 27th, 1941, airing from 9-9:30PM. It was only irregularly broadcast after that, on different days and at different times. On February 25th, 1942, it settled on Wednesdays from 8:30-9PM but was still not seen weekly. It was last broadcast on WNBT on Wednesday, April 8th, 1942. It moved to W2XWV (the experimental DuMont station) beginning Sunday, May 10th and stayed there until January 2nd, 1944, although it was not seen every week. It was still on the air as late as June 1946, now on WABD (DuMont became a commercial station in May of 1944) and seen on Wednesdays. WCBW broadcast many other programs during the summer and fall of 1941, many of them weekly and some daily, but very little is known about them other than their titles. The Boys in the Back Room, for example, ran every Monday from 2:45-3:15PM from August 4th, 1941 through December 1st, 1941. Two fifteen-minute programs starring singers Joan Edwards and Tamara were alternated Mondays, Wednesdays and Fridays from 8:15-8:30PM. The Joan Edwards program premiered Tuesday, September 1st and was broadcast through July 30th, 1941, when the Tamara program took over. Joan Edwards returned on August 19th before going off the air again a few times during December and continued through the end of May 1942, occasionally being replaced by Tamara. Every Thursday, beginning July 1st, WCBW broadcast a half-hour program that displayed the paintings held at the Metropolitan Museum of Art. During the first program, host Francis Henry Taylor, director of the museum, suggested that television “will be the instrument which will create as complete a revolution in the education of the future as the discovery of movable type and the invention of the printing press 400 years ago” . The half-hour program, shown from 2:45-3:15PM, was repeated Tuesday evenings. Unlike WCBW, WNBT had very few weekly or daily programs. The bulk of its shows were irregularly scheduled, with weeks or even months between broadcasts. A few of the more common programs included Stars of Tomorrow, first broadcast Wednesday, July 16th; a fifteen-minute program featuring singer Harvey Harding, first shown Friday, July 18th; Play the Game, a quiz show hosted by Dr. Harvey Zorbach, first broadcast Thursday, August 7th, 1941; and Zeke Manners Hillbillies, first shown Tuesday, August 12th, 1941. Other WNBT programs, some shown only a handful of times, included Words on the Wing, Common Knowledge (a quiz show), Good Neighbors, Summer Time Revue, Whispering Jack Smith’s Prevues, Ireene Wicker’s Tele-Whizzes, Believe It Or Not (with Robert L. Ripley), The Inquiring Reporter/Photographer, and unnamed shows starring Larry Blacke (monologist), June Boyd (xylophone), Mary Sutherland (comedienne), the Deep River Boys (singers), and Betty Randall (singer). On May 12th, 1942, the growth of commercial television was halted when the War Productions Board ordered a halt to construction of new television stations . Both WNBT and WCBW drastically cut their television output beginning as of June 1942. WNBT broadcast a series of Air Warden Basic Courses in June, while WCBW aired Red Cross programs on Thursdays. For the most part, the war would curtail the advancement of television until 1946. But for almost a year, from July 1941 to May 1942, for viewers in New York City and a select few other cities, television was a reality. 1 For a lengthy look at this “false dawn” for commercial television, see Stay Tuned: A History of American Broadcasting, by Christopher H. Sterling and John Michael Kittross (Lawrence Erlbaum Associates, Publishers, 2002, 3rd Edition, Pages 165-168). 2 “FCC Gives Television Commercial Broadcast Rights Starting July 1.” Wall Street Journal. 3 May 1941: 1. 3 “Television Sale Of Its Programs Approved By FCC.” Chicago Daily Tribune. 3 May 1941: 3. 5 “Television To Go On Sponsor Basis.” New York Times. 3 May 1941: 17. 7 The NAB estimate is from a May 3rd, 1941 article in The Chicago Daily Tribune (“Television Sale of Its Programs Approved By FCC,” Page 3). An article in The New York Times (“Television To Go On Sponsor Basis,” 3 May 1941, Page 17) puts the number of television sets in “the New York area” as “more than 3,000” with an additional thousand sitting in warehouses. Sterling and Kitross, in Stay Tuned: A History of American Broadcasting, state that “by the time we entered World War II, between 10,000 and 20,000 sets were in use, half in New York and the rest in Philadelphia, Chicago, Schenectady, and Los Angeles” (Page 230). 9 “Advertising News and Notes.” New York Times. 1 Jul. 1941: 40. 10 This schedule comes from the radio listings in the July 1st, 1941 edition of The New York Times (“Radio Today,” Page 44). According to another article in that day’s paper, WNBT was on the air from 1:20PM through 10:30PM with a break from 5-8PM (“Television Starts Today,” Page 15). An article in the June 29th, 1941 edition of The New York Times showed the baseball game beginning at 2:20PM, not 2:30PM (“Welding Sight to Radio’s Sound,” Page X10). 11 “Advertising News and Notes.” New York Times. 2 Jul. 1941: 30. 12 Von Schilling, James A. The Magic Window: American Television, 1939-1953. New York City: The Haworth Press, Inc.: 37. 14 “Radio Today.” New York Times. 1 Jul. 1941: 44. 15 “Footnotes on Headliners.” New York Times. 6 Jul. 1941: E2. 16 According to August 3rd, 1941 edition of The New York Times, “many more are projected and several already are near the rehearsal stage” (Kennedy, Jr., T.R., “An Auspicious Beginning.” Page X10). It is unclear whether the four sponsors for the July 1st, 1941 broadcasts are included in this total. 17 Von Schilling states that during the summer of 1941 WNBC “had little success in attracting sponsors and reverted back” to the sort of programming “that had been on the schedule before the station went commercial” (The Magic Window, Page 38). 18 Kennedy, Jr., T.R. “Directing for Television.” New York Times. 24 Aug. 1941: 149. 19 As with all the programs discussed in this article, start and end dates for Men at Work come from television listings in The New York Times which were likely printed early and thus not reflect what was actually shown. They are the best indication of what was on television in 1941, however. 20 Abelman, Robert. Reaching a Critical Mass: A Critical Analysis of Television Entertainment. Mahwah, New Jersey: L. Erlbaum Associates: 270. 21 Frances Buss later went on to become the first female director at CBS. Her name is sometimes given as Frances Buch, which would be her married name. For more about Frances Buss, see her biography at The Paley Center for Media’s “She Made It” series. 22 “First Fashion Show Televised In Move to Boom City’s Style.” New York Times. 19 Sep. 1941: 18. 23 Display Ad. New York Times. 18 Sep. 1941: 9. 25 Allen, Doug. How to Write for Television. New York: E.P. Dutton & Co., Inc., 1946: Page 31. 26 Allen, Doug. How to Write for Television. 31. 27 Stewart, R.W. “Television Goes Into the Entertainment Field as a New Merchandising Medium.” New York Times. 6 Jul. 1941: X10. I’m researching someone who appeared on Doug Allen’s Thrills and Chills show. It was probably in the fall of 1941 or early in 1942. Do you know how I can find out the exact date or if any archive of the actual shows exists? I’ve put together a status guide/broadcast history that includes spotty information regarding guests on Thrills and Chills Everywhere between 1941 and 1944. I hope it helps. Wow! I can’t even begin to imagine how primitive television must have been in 1941! Not to mention the lack of programming available then! The very first commercial was reportedly shown at 2:29 PM one minute before the start of the baseball game (Baseball at Ebbets Field, Dodgers vs. Phillies). It was a WNBT test pattern modified to like like a clock with the words “Bulova Watch Time’ in the lower right hand quadrant. It remained on screen while the second hand went around for one minute. Unclear as whether or not there was a voiceover announcement to accompany the image.